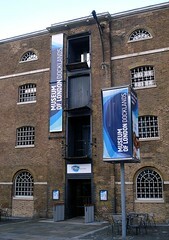 Museum covering the history of London's Docklands. It's housed in a converted warehouse at the north end of the Isle of Dogs near West India Quay Station. Entry is free. The galleries live on the second and third floors, and visitors are advised to start on the third floor and work down. The displays are generally in a fairly linear ordering, and there are frequent signposts pointing the way to the exit in case you do manage to get turned around. There's a fair bit of content — allowing an hour per floor would not be excessive. The third floor covers the period from the Romans to the end of the 1800s, with a nice mixture of storyboard and exhibits, though it could perhaps go into more detail about where the Roman amphorae etc were found. There are also a number of interactive touchscreens scattered around, though some of them are a little low-res, and on Kake's January 2010 visit a couple of them weren't working; also, it was quite hard sometimes to hear the audio track over the sound of other visitors' voices. Highlights of this level include the large scale model of London Bridge in two different periods; circa 1440 on the side you see first, and circa 1600 around the back. The third floor finishes with a permanent gallery called London, Sugar & Slavery, covering the part London and Londoners played in the slave trade. The second floor takes the story onwards from where the third floor left off, covering transport and wartime, among other subjects. There's a gift shop in one corner of the foyer, with a small but well-chosen selection of books about London, unsurprisingly focusing on Docklands and the East End, but also including children's books and books on Africans in London (presumably to go with the London, Sugar & Slavery gallery). Accessibility: Level to get in, and there are lifts to all floors. There are clearly-marked accessible toilets on the ground floor and third floor. Mobility scooters and wheelchairs are available to borrow (probably free of charge, not sure). On the third floor (where visitors are advised to start their visit) there are foldable seats that you can pick up and carry around with you, though they're a little narrow. On Kake's January 2010 visit, some of the exhibits and storyboards on the third floor were not very well-lit, though the fonts used were a decent size. Last visited by Kake, January 2010. Opening hours taken from the Museum Of London website, September 2013. Last edited 2019-02-07 12:41:31 (version 15; diff). List all versions. Page last edited 2019-02-07 12:41:31 (version 15).